"Professor Layton and the Diabolical Box (レイトン教授と悪魔の箱 Reiton-kyōju to Akuma no Hako), known in Australia and Europe as Professor Layton and Pandora's Box, is the second game in the Professor Layton series by Level-5. It was followed by a third game, Professor Layton and The Last Time Travel. 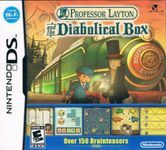 The game follows Professor Layton and his apprentice Luke as they travel cross country by train to solve the mystery behind a strange box that is said to kill anyone who opens it. Professor Layton and the Diabolical Box is an adventure/puzzle game. The player controls the movements of the eponymous Professor Layton and his young assistant Luke through several locations, unlike in the previous game which is confined to just one town. Along with completing many different types of puzzles, players must explore different areas, solve mysteries, and aid the Professor on his quest." Source: Wikipedia, "Professor_Layton_and_the_Diabolical_Box," available under the CC-BY-SA License.